I knew this day was coming and couldn’t be more thrilled that it is finally over. All of the prep work in the world still can’t get you completely ready for what this day was in terms of sheer draft mayhem. It started with a trip about 1 hour South of my home for a 16 team keeper draft with a hard salary cap. It is extremely fun and challenging to draft for a salary cap. If you have not done so previously, try to seek out a league like this. At the very least, a deep league with hard caps allow greater talent in the free agent pool because you can’t stack your team full of high dollar starters. 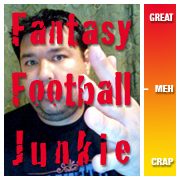 The Only question I had going into that draft was what to do with my long-term keeper MJD? I ended up keeping him (along with Wes Welker), and that decision could make-or-break my year. On a good note, I drafted Matt Schaub to be my starting QB and the guy behind me says, “I would rather have Schaub than Phillip Rivers (Whom he kept…) and I said, “Wanna trade?” And he said yes, so we did. I can tell you this, I’m much happier having Rivers in a 16 team league than Schaub who has had 2 full seasons in the past 5 years. Immediately following that draft and a beer to reflect, I drove home to make it just in time for my Brother In-Laws league. Another 16 team keeper league. But in this league you are allowed two keepers which take the place of your 1st and 3rd round picks. I kept Tom Brady and Chris Johnson. Either one of those two in the third round is a steal, so it was a no brainer. And then, before that draft had finished it’s ridiculous nearly 3 hour run, the official Fantasy Football Junkie’s draft had started. So not only did I draft three leagues today, two of them were overlapping. I don’t suggest doing this but sometimes there isn’t a whole lot you can do about it. Schedules for that many people are hard to nail down and you gotta do the best you can do! My league was the simplest, no keepers and no PPR. Only real difference to standard is that quarterbacks get 6 points for thrown touchdowns. Which anymore is the standard, out of the 6 leagues I play, non of them score 4 points for thrown TD’s. And now it’s nearly midnight. What did I learn in these drafts? 1. I really like Antonio Brown and Torrey Smith. I got furious when someone nabbed him before me and I got giddy when I was able to get him on my team. 2. I stayed true to not picking up any Washington or New England backs early. In fact the only one I went for was the last pick in one league and I took Alfred Morris on a flyer. You never know! 3. Getting a firs tier QB is the trend times a million this season. In the first draft, a 16 team keeper, the first available picks went Luck, Ryan, Griffin III and Peyton. In that order. It was sheer craziness. 4. I’m betting on some trendy names. I picked up Ryan Williams in two leagues and targeted David Wilson, but only got him in one. 5. I love Russell Wilson and I had no idea. Ended up getting him as a backup in two leagues. I’m sure there were some other things I’m forgetting but it’s midnight and time for me to sleep. After-all, I have two young, adorable babies to wake up to in the morning. And they don’t normally sleep in. Frog, nice to see ya! Where have you been? I sent you the initial invites to the league but you never signed up. Hopefully I can get you back in next year! Hmmm, tough choices to choose from. Is none of the above acceptable, lol? Honestly as a backup, I take a chance on Royal, Quick and Edwards in that order. Hopefully your starters are solid enough that you wont need them for anything but bye weeks. I do think in a ppr league, Royal has a shot at being more than bye week fodder though. Yeah I know my choices are kind of weak..lol I was thinking Royal too. I do have two very strong WRs but that all I have for WR, so I need at least 1 more..maybe two…I suppose I’ll drop mike Tolbert..I think the guy actually has legit RB talent, but it looks like he’s delegated to fullback duties this year.. I might hold onto Tolbert for at least a few more hours, have the Panthers said how bad J.Stewart’s injury is? I know they took him into the locker room on a cart after an apparent ankle injury. they said there was no structural damage to Johnathon Stewart’s ankle according to tests done…they are doing more tests however just to be sure. Love the Russell Wilson pick! Could be a huge steal with high upside if he stays the starter. Nice pick with Ryan Williams too, worth taking a shot on and see what happens.